For other people named Chris Collins, see Chris Collins (disambiguation). Christopher Carl Collins (born May 20, 1950) is an American politician serving as the U.S. Representative for New York's 27th congressional district since 2013. Collins was the first sitting U.S. Representative to endorse Donald Trump for President of the United States, and he served on Trump's presidential transition team. A member of the Republican Party, Collins was elected Erie County Executive in 2007 and held that position for one term. Collins and his son, Cameron Collins, were arrested by the Federal Bureau of Investigation on August 8, 2018 and charged with insider trading and making false statements. Three days later, Collins announced that he was suspending his bid for a fourth term in Congress; however, on September 17, 2018, he resumed his re-election campaign. Collins was narrowly re-elected to Congress on November 6, 2018, with his 2016 percentage of 67% reduced to 49%. Collins was born in 1950 in Schenectady, New York, the son of Constance (Messier) and Gerald Edward Collins. Collins moved around the country with his family, as his father was transferred several times by General Electric. Collins graduated from Hendersonville High School in Hendersonville, North Carolina in 1968. Collins earned a Bachelor of Science in Mechanical Engineering from North Carolina State University, where he was a member of the Sigma Pi fraternity, in 1972. Collins was inducted into the North Carolina State University Mechanical and Aerospace Engineering Department Hall of Fame in November 2015. He then earned a master's degree in business administration from the University of Alabama at Birmingham in 1975. Collins worked as a mechanical engineer at Westinghouse Electric. Collins also served as President and CEO of Nuttall Gear Corporation located in Niagara Falls, New York. Nuttall Gear was a 1983 leveraged buyout of the Westinghouse Electric Gear Division located in Buffalo, New York. In 1997, Collins sold Nuttall to Colfax Corporation, based in Annapolis, Maryland. As of 2018, Collins and his wife, Mary, had three children and three grandchildren. Collins ran for Erie County Executive in 2007 on a platform of smaller county government, lower taxes and Six Sigma. His campaign slogan was "Elect a Chief Executive, not a Chief Politician." Collins defeated Democrat James P. Keane, the deputy county executive of the Dennis Gorski administration, with 63% of the vote; his win was considered an upset. On November 8, 2011, Collins lost his bid for re-election in a race that he was predicted to win. He was defeated by Democratic candidate Mark Poloncarz, the Erie County Comptroller. In a county with 140,000 more Democrats than Republicans, Collins won 39 of the 44 municipalities. Poloncarz won the five remaining municipalities, including the City of Buffalo, by a margin of 81% to 19%. When Collins became Erie County Executive, he inherited from his Republican predecessor, Joel Giambra, a nearly bankrupt county that had state-imposed fiscal control with a budget of $1.2 billion. Collins spoke for three minutes at the 2008 Republican National Convention on September 3, 2008. By June 2009, the state-imposed strict oversight of the Erie County budget ended. Collins recruited a Six Sigma Master Black Belt from the University at Buffalo who had previously worked as an executive at a Delphi to implement Lean Six Sigma across all county departments under the direction of the county executive to improve efficiency and reduce costs. The position's $115,000 salary plus associated costs was funded by a grant of taxpayer money from the Erie County Control Board. Collins sued the county so that he could unilaterally increase the county attorney's salary. The State Supreme Court Judge presiding over the case ruled in favor of Collins and awarded the higher salary to the incoming County Attorney. Collins was sued by the United States Department of Justice for repeated civil rights violations of prisoners held in county facilities, including juveniles and prisoners with developmental disabilities. The Department of Justice and Erie County co-signed a stipulated settlement of dismissal in August 2011. He was also sued by the County Legislature for refusing to issue payments to Erie Community College that had been included in the County's budget. As County Executive, Collins created the Brighter Future Fund, donating his county salary to local non-profit organizations for the first 18 months of his tenure. In February 2008, Erie County experienced a potential Hepatitis A emergency when an infected employee handled produce at a popular supermarket. Over the course of several days, the County vaccinated and inoculated 10,000 people to protect the public. The event was one of the largest vaccination events in the history of the United States. In January 2010, two Republican Members of the New York State Assembly (including Republican Assemblyman Joseph Errigo), claimed that Collins had behaved inappropriately at Gov. David Paterson's State of the State address. According to the two assemblymembers, the event was crowded, and Collins made the following comment to a female attendee: "I'm sure if you offer someone a lap dance you can find a place to sit." Collins denied making the comment, and claimed that there was a "political smear campaign" going on against him. During his lame duck period as Chief Executive, Collins proposed spending $6 million to upgrade housing for polar bears at Buffalo Zoo at the same time as he proposed to lay off 155 workers. Beginning in 2009, Collins was mentioned as a potential candidate for Governor of New York in the 2010 election, particularly if Rudy Giuliani decided not to run. In January 2010, Collins announced that he would not run for governor that year. Before he lost his 2011 bid for re-election, Collins was mentioned as a potential candidate in the 2014 gubernatorial election. In 2013, Collins disclaimed any interest in running for Governor in 2014. In 1998, Collins challenged 24-year incumbent Democratic U.S. Congressman John J. LaFalce in New York's 29th congressional district. During the campaign, Collins was one of the first congressional candidates to call for President Bill Clinton's resignation in the wake of the Monica Lewinsky scandal. LaFalce touted his record of bringing home the bacon and defeated Collins by a margin of 58% to 41%. After losing his County Executive re-election campaign in 2011, Collins initially ruled out a future bid for elected office. In January 2012, he was reported to be considering running for Congress and on March 25, 2012, Collins announced he was running in New York's newly-drawn 27th Congressional District. The district had previously been the 26th District, and had long been a Republican bastion. However, in a 2011 special election, Democratic Erie County Clerk Kathy Hochul became the first Democrat to represent the district since 1971. On June 26, 2012, Collins won the Republican primary, defeating Iraq War veteran David Bellavia 60%–40%. Collins had the Republican and Conservative party lines for the November general election and defeated Hochul 51%–49%, a difference of 4,312 votes. Collins won re-election to a second term by defeating Democratic opponent Jim O'Donnell 72%–28%. Collins won re-election to a third term by defeating Democratic opponent Diana K. Kastenbaum 220,885 (67.7%) to 107,832 (32.3%). On August 11, following his arrest on federal charges of insider trading, Collins announced that he was suspending his reelection campaign; he added that he intended to serve out the balance of his term. Under New York election law, Collins would remain on the ballot for the November election unless he died, accepted a nomination for a different office, moved out of state, or was disqualified. According to CNN, Republican officials considered nominating him for a town clerk position; this move would allow Collins to be removed from the ballot and replaced with a different candidate. In either case, the eight Republican county chairs in the district would then select a replacement in a vote weighted by county population. Twelve Republicans were mentioned as potential replacements for Collins on the general election ballot. On September 17, 2018, Collins reversed his decision about the upcoming election, stating that he would remain on the ballot and campaign for another term in office. Collins was re-elected by a much narrower margin than he had been in prior years, defeating Democrat Nate McMurray, 49.5% to 48.4%. Collins was sworn in on January 3, 2013. Prior to taking the oath of office, House Republican leadership appointed him to serve on both the Agriculture and Small Business committees in the 113th Congress. Soon after taking office, House Small Business Committee Chairman Sam Graves tapped Collins to chair the subcommittee on Healthcare and Technology. On March 20, 2014, Collins chaired a field hearing, titled Expanding Broadband Access and Capabilities to Small Businesses in Rural New York. This field hearing was held at the Orleans County Legislature in Albion, New York, examining access to broadband in rural communities, and the role of the federal government in expanding these capabilities to small businesses. Following the field hearing, Collins hosted a roundtable discussion with local community leaders to continue the discussion on the importance of access to broadband in rural communities. In announcing his committee assignments, Collins said one of his top goals as a member of Congress would be to work with his colleagues to pass a new Farm Bill. On May 15, 2013, Collins voted to approve the 2013 Farm Bill. On January 29, 2014, Collins voted to approve the Conferenced Farm Bill, known as the Agricultural Act of 2014. President Obama signed the 5 year Agricultural Act of 2014 into law on February 7, 2014. In response to a proposal by New York State Governor Andrew Cuomo to provide state prison inmates with a publicly financed college education, Collins introduced the Kids Before Cons Act in February 2014. The bill would prohibit states from using federal funding for the purpose of providing a college degree to convicted criminals. Collins called the Governor's proposal an insult to law-abiding taxpayers who are struggling to put themselves or their children through college. Collins' bill would allow federal dollars to be used for GED and working training programs in prisons and correctional facilities. Cuomo later abandoned his proposal to use public money to fund his initiative. In the 114th Congress, Congressman Collins served on the House Energy and Commerce Committee. He stated his priorities on the Energy and Commerce Committee would be securing American energy independence, ensuring companies at the Buffalo Niagara Medical Campus receive a fair amount of funding in the competitive grants offered by the National Institutes of Health, continuing oversight of the government's approval for new drugs and medical treatments, and increasing access to broadband Internet service in rural areas. Although Collins was re-elected, the Republicans have voted in new rules that bar indicted Congressmen, such as Collins, from serving on any committees. After initially endorsing Jeb Bush in the 2016 presidential election and donating money to a Bush-aligned SuperPAC, Collins endorsed Donald Trump for President when Bush dropped out of the race. Collins endorsed Trump on February 24, 2016, becoming the first sitting member of Congress to endorse him. He cited shared pasts in business and a need for businessmen in the White House as having influenced his decision. On July 18, Collins seconded Trump's nomination at the 2016 Republican National Convention. According to The New York Times, Collins is "one of Donald Trump’s earliest and most ardent supporters". Following the 2016 election, Collins served on Trump's presidential transition team. On May 4, 2017, Collins voted in favor of repealing the Patient Protection and Affordable Care Act (Obamacare) and to pass the American Health Care Act. Collins made headlines for admitting he had not read the full health care bill before voting. In an interview with a Buffalo News reporter, Collins admitted that he was unaware but unconcerned that New York would lose $3 billion worth of federal funds annually under the AHCA, by losing New York's Essential Health Plan, an optional ACA program that provided low-cost health insurance to thousands of "low- and middle-income people who d[id]n't qualify for Medicaid", to which Collins responded, "No. [I was not aware] But it doesn't surprise me for you to tell me that there were two states in the nation that were taking advantage of some other waiver program and New York was one of the two states." In an interview in The Batavian on June 24, 2012, Collins said: "People now don't die from prostate cancer, breast cancer and some of the other things. The fact of the matter is, our healthcare today is so much better, we're living so much longer, because of innovations in drug development, surgical procedures, stents, implantable cardiac defibrillators, neural stimulators – they didn't exist 10 years ago." In response, Elise Foley of The Huffington Post wrote, "An estimated 577,190 people in the United States will die from cancer this year, including about 39,920 deaths from breast cancer and 28,170 from prostate cancer", citing data from the American Cancer Society. Artvoice wrote, "The implantable cardiac defibrillator and neural stimulators, or TENS devices, were both invented and patented in the late 60s or early 70s; therefore, they existed '10 years ago'". In February 2014, Collins introduced the Kids before Cons Act to prohibit the use of federal money to provide college education to convicted criminals in prison. An editorial in The New York Times said, "These ridiculous arguments are unmoored from both reason and reality." A 2013 RAND study of 30 years of research found that every dollar spent on inmate education saves $4 to $5 on re-incarceration. Collins supported Donald Trump's May 9, 2017, firing of FBI Director James Comey, saying "The Director of the FBI serves at the pleasure of the President. I respect President Trump's decision at the recommendation of the Attorney General." Collins supported President Donald Trump's 2017 Executive Order 13769 restricting immigration from seven Muslim-majority countries. He stated that "I get a little frustrated with the folks who don't like Trump trying to make something into something it's not. So I'm just disappointed that we can't have a true and honest debate without someone inflaming the situation and claiming there's religious overtones." Collins was one of only two House members from New York state (along with Tom Reed) to support the provision in Republican tax overhaul bill introduced November 2, 2017, eliminating personal deductions for state income taxes on federal tax forms. In response New York Governor Andrew Cuomo labeled the two lawmakers "the Benedict Arnolds of their time", claiming that the loss of the deduction would cost New York State taxpayers nearly $15 billion and do grave damage to the state. Collins said that under Cuomo, New York is the highest-taxed, most regulated, least business-friendly state in the nation and urged Cuomo to cut the state's budget. Asked if his donors were pleased with the House's tax reform plan so far, Collins said, "My donors are basically saying 'get it done or don't ever call me again.'" In October 2009, Collins compared New York State Assembly Speaker Sheldon Silver, who is Jewish, to Adolf Hitler, Napoleon, and the antichrist. Collins later apologized for his comments. On November 28, 2016, Collins made strongly negative remarks about Mitt Romney, who was being considered by President-elect Donald Trump for the position Secretary of State. On the TV show New Day, Collins said, "What do I know about Mitt Romney? I know that he's a self-serving egomaniac who puts himself first, who has a chip on his shoulder, and thinks that he should be president of the United States." On February 10, 2017, Collins told Chris Cuomo on CNN's New Day that elected officials should not have to release their respective tax histories. This comment was made in response to the ongoing controversy surrounding President Trump's refusal to release his tax forms. Following a June 14, 2017 shooting during a GOP baseball practice for an annual Washington, DC charity game that pits Democrats versus Republicans, Collins blamed Democrats, saying, "I can only hope that the Democrats do tone down the rhetoric. The rhetoric has been outrageous in the anger directed at Donald Trump." Shortly after making that comment, Collins noted that it was important for everyone, including himself, to tone down partisan rhetoric and "recognize that we are all one country and all proud Americans." Collins also vowed to start carrying a gun with him "from this day forward." In August 2016, Collins became the largest shareholder in a company called Innate Immunotherapeutics. In May 2017, House ethics investigators "began probing Collins for his role in recruiting investors to buy stock in Innate Immunotherapeutics after several complaints were filed." Members of Congress are explicitly barred from trading stocks using insider information. In October 2017, the Office of Congressional Ethics (OCE) said they had "substantial reason" to believe that Collins had improperly used his public office to benefit Innate, and had forwarded nonpublic information to other investors. The OCE said Collins sent nonpublic information to investors about drug trials and that he visited the National Institutes of Health to discuss a drug's clinical trial, saying that this violated House ethics rules. The House Ethics Committee did not appoint a subcommittee to continue investigating Collins' case. On August 8, 2018, Collins, his son Cameron, and the father of Cameron's fiancée, Stephen Zarsky, were arrested by the FBI and charged with wire fraud, conspiracy to commit securities fraud, securities fraud, and lying to the FBI. Later that day, Speaker of the US House of Representatives Paul Ryan announced that he had removed Collins from his position on the House Energy and Commerce Committee. He also referred the matter to the House Ethics Committee. According to the federal government, on June 22, 2017, the CEO of Innate Phamarceuticals sent an email to the company's board of directors, including Collins. The e-mail explained that an important drug trial for the company had failed. Collins allegedly received this news while attending a picnic at the White House and, upon seeing the email, immediately phoned his son and instructed him to sell shares in the company. According to the allegations, the sale allowed Collins and his family to save around $570,000 in losses. The shares eventually dropped around 90% once news about the drug trial became public. Collins has maintained that he is innocent of the charges against him. ^ "Who's who in Finance and Industry". Marquis Who's Who. October 30, 2018 – via Google Books. ^ "Gerald E. "Jerry" Collins obituary". Legacy.com. January 8, 2010. Retrieved September 5, 2013. ^ Axtell, Nathaniel (November 13, 2012). "Congressman-elect Chris Collins of New York is a 1968 graduate of Hendersonville High School". BlueRidgeNow.com. Retrieved September 5, 2013. ^ "Alumni Keep Active" (PDF). The Emerald of Sigma Pi. Vol. 68 no. 1. Spring 1980. p. 7. ^ "Congratulations to the 2015 MAE Hall of Fame Inductees". North Carolina State University. November 19, 2015. Archived from the original on January 5, 2016. Retrieved January 11, 2016. ^ a b "Representative Chris Collins's Biography". Vote Smart. Retrieved November 14, 2012. ^ a b "Republican Congressman Chris Collins Was Just Arrested for Insider Trading". August 8, 2018. ^ a b "History". Nuttall Gear. Retrieved September 5, 2013. ^ a b c Celock, John (November 16, 2011). "Chris Collins, Erie County Executive, Proposes Polar Bear Housing Amid Layoffs". The Huffington Post. Retrieved April 18, 2013. ^ a b c Celock, John (November 9, 2011). "Chris Collins, Potential Andrew Cuomo Opponent, Defeated In Reelection Bid". The Huffington Post. Retrieved April 18, 2013. ^ a b c d McKinley, Dave (January 9, 2012). "Chris Collins Considering Getting Back Into Politics". WGRZ. Archived from the original on February 9, 2013. Retrieved April 18, 2013. ^ Kompos, Athan. "Poloncarz Wins Erie County Executive Race". WGRZ. Archived from the original on February 10, 2013. Retrieved November 14, 2012. ^ "Collins uses three minutes in spotlight to cover a lot of political ground". The Buffalo News. September 4, 2008. Retrieved September 5, 2013. ^ "Control board shifts to advisory status while warning that it 'will not go away'". The Buffalo News. June 3, 2009. Retrieved September 5, 2013. ^ "New, old faces form Collins' team". Bizjournals.com. December 21, 2007. Retrieved September 5, 2013. ^ Spina, Matthew (April 5, 2011). "Judge orders higher pay for county lawyer" (PDF). The Buffalo News. Retrieved March 19, 2013. ^ "Judge orders higher pay for county lawyer" (PDF). Erie.gov. Retrieved February 25, 2015. ^ United States Department of Justice. "Justice Department Files Lawsuit Challenging Conditions at Two Erie County, New York, Correctional Facilities". Retrieved March 15, 2013. ^ "U.S. suit on county jail, prison to be dismissed; Justice Department, county attorney sign agreement to end legal action, Collins says". The Buffalo News. August 18, 2011. Retrieved September 5, 2013. ^ Sampson, Doug. "Erie County Legislature sues County Executive Chris Collins". Retrieved March 15, 2013. ^ "Top county salaries create 'Bright Future'". Bizjournals.com. February 6, 2008. Retrieved September 5, 2013. ^ "Hepatitis scare raises concerns Offers glimpse into nightmare of a flu pandemic". February 14, 2008. ^ "The Daily Politics", "Collins' Foot-In-Mouth Disease? ", New York Daily News, December 18, 2010; retrieved January 15, 2017. ^ Zremski, Jerry, "Bellavia attacks Collins, controls Google search", The Buffalo News, June 23, 2012; retrieved January 15, 2017. ^ Buckley, Eileen (January 21, 2010). "Collins accuses Albany insiders of political smear campaign | WBFO". News.wbfo.org. Retrieved August 8, 2018. ^ Dicker, Fred (May 18, 2009). "BIZMAN POL IS GOPERS' PLAN B". New York Post. Retrieved May 19, 2009. ^ "Collins, Lazio Get to Sit Up Front at Conservative Party Dinner". Archived from the original on September 7, 2009. Retrieved July 26, 2009. ^ "Is Chris Collins Running For Governor?". WBEN. Archived from the original on July 18, 2011. Retrieved July 26, 2017. ^ McCarthy, Robert (January 26, 2010). "Collins ends run for governor". The Buffalo News. Retrieved January 25, 2010. ^ Reisman, Nick (January 27, 2013). "'Collins: Run For Governor Is 'Off The Table'". Capital Tonight. ^ "News Archives: The Buffalo News". Nl.newsbank.com. October 29, 1998. Retrieved September 5, 2013. ^ "News Archives: The Buffalo News". Nl.newsbank.com. October 30, 1998. Retrieved September 5, 2013. ^ "1998 Election Statistics - Legislative Activities - Office of the Clerk". clerk.house.gov. ^ "Election 2012 – New York 27th District – Collins vs. Hochul". RealClearPolitics. Retrieved September 5, 2013. ^ "New York House results – 2014 Election Center". CNN. Retrieved February 25, 2015. 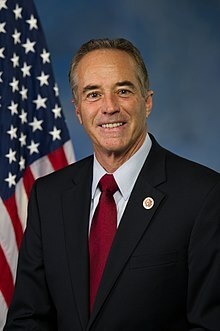 ^ "New York U.S. House 27th District Results: Chris Collins Wins". The New York Times. ^ a b c d Meagan Vazquez; Eric Bradner (August 11, 2018). "Chris Collins suspends re-election campaign following insider trading charges". CNN. ^ Cheney, Kyle; Vielkind, Jimmy (August 11, 2018). "Rep. Chris Collins, fighting prosecution, seeks to end reelection bid". Politico. Retrieved August 11, 2018. ^ Flasch, Jane (August 28, 2018). "Deadline looming for Republican action on NY-27 seat following Collins' indictment". WHAM-TV. ^ Goldmacher, Shane; Foderaro, Lisa W. (September 17, 2018). "Reversing Course, Chris Collins Will Seek 4th House Term Despite Indictment". The New York Times. ^ Goldberg, Hendry (November 7, 2018). "Indicted New York Republican Chris Collins Wins Re-Election". Bloomberg News. ^ "Congressman-elect Chris Collins Receives Committee Assignments > WBTA AM 1490 Batavia, New York". Wbta1490.com. December 14, 2012. Retrieved September 5, 2013. ^ "Collins gains rare rookie honor as subcommittee chief". The Buffalo News. Retrieved September 5, 2013. ^ Krencik, Jim (March 21, 2014). "Telecom reps offer testimony at rural broadband hearing". The Daily News. Archived from the original on March 25, 2014. Retrieved March 31, 2014. ^ Balaban, Howard (March 21, 2014). "Collins hears broadband testimony". Lockport Journal. Retrieved March 31, 2014. ^ "Collins arranges local hearing on broadband issues". The Medina Journal Register. March 17, 2014. Retrieved March 31, 2014. ^ Krencik, Jim (March 21, 2014). "Life in the 'last mile' is ... (buffering)". The Daily News. Archived from the original on March 31, 2014. Retrieved March 31, 2014. ^ "Collins talks to farmers in 27th Congressional District". MPNnow.com. January 7, 2013. Archived from the original on February 16, 2013. Retrieved September 5, 2013. ^ "Farm Bill sent to full House, Senate". The Daily News Online. Archived from the original on September 5, 2013. Retrieved September 5, 2013. ^ "House Ag Committee Approves Farm Bill With Significant Savings & Reforms | Committee on Agriculture". Agriculture.house.gov. Archived from the original on September 6, 2013. Retrieved September 5, 2013. ^ Martin, Sloane (January 29, 2014). "Farm Bill Passes House". WBTA AM 1490. Retrieved February 10, 2014. ^ Shear, Michael (February 7, 2014). "In Signing Farm Bill, Obama Extols Rural Growth". The New York Times. Retrieved February 10, 2014. ^ Kasperowicz, Pete (February 26, 2014). "Should taxpayers fund college courses for prison inmates". The Hill. Retrieved May 4, 2017. ^ "Collins joins state legislators in opposition to Cuomo's 'College for Convicts' Plan". The Livingston County News. February 21, 2014. Archived from the original on April 23, 2014. Retrieved May 4, 2017. ^ Kaplan, Thomas (April 3, 2014). "Cuomo Drops Plan to Use State Money to Pay for College Classes for Inmates". The New York Times. Retrieved May 4, 2017. ^ "Collins to join influential House Energy and Commerce Committee". The Buffalo News. December 4, 2014. Retrieved January 3, 2015. ^ a b c "New York GOP Rep. Chris Collins arrested on insider trading charges". Cnbc.com. Retrieved August 8, 2018. ^ a b Staff, Writer (2018-08-08). "Live stream: Rep. Chris Collins arrest discussed by prosecutors". USA Today. Retrieved 2018-08-08. ^ a b c "New York Congressman Chris Collins Is Charged With Insider Trading". The New York Times. Retrieved August 8, 2018. ^ Tully-McManus, Katherine (August 8, 2018). "Speaker Ryan Strips Chris Collins of Committee Membership". Roll Call. Retrieved 6 December 2018. ^ Linge, Mary Kay (November 17, 2018). "House GOP votes on new rules to kick indicted lawmakers off committees". New York Post. Retrieved January 12, 2019. ^ Zremski, Jerry (August 24, 2016). "Clinton outraises Trump eightfold in Western New York". The Buffalo News. ^ a b Zremski, Jerry (February 24, 2016). "Chris Collins becomes first sitting member of Congress to endorse Trump". The Buffalo News. ^ Gorbman, Randy. "Rep. Chris Collins Gets To Second Trump's Nomination". ^ "Third-Party Line Will Feature Governor Cuomo, and a Slew of Republicans". Retrieved August 1, 2018. ^ WGRZ-TV, "Rep. Chris Collins named to Trump transition team", Democrat and Chronicle, November 16, 2016. ^ "How the House voted to pass the GOP health-care bill". Washington Post. Retrieved May 4, 2017. ^ Staff, C.N.N. "How every member voted on health care bill". CNN. Retrieved May 4, 2017. ^ Manduley, Christina. "Congressman admits he didn't read full health care bill before voting". CNN. Turner Broadcasting System, Inc. Retrieved May 5, 2017. ^ Jerry Zremski (May 4, 2017). "Watch: Chris Collins admits he didn't read health care bill". The Buffalo News. Retrieved May 5, 2017. ^ Owens, Howard (June 24, 2012). "Chris Collins wants to go to Washington to restore the American Dream". The Batavian. Retrieved November 14, 2012. ^ Foley, Elise (July 3, 2012). "Chris Collins: 'People Now Don't Die From Prostate Cancer, Breast Cancer'". The Huffington Post. Retrieved November 14, 2012. ^ "Collins: People Don't Die from Prostate, Breast Cancers Anymore". Retrieved July 5, 2012. ^ "Gov. Cuomo Drops the Ball". The New York Times. April 8, 2014. ^ "Congressional representatives from Rochester area react to Comey firing". 13wham.org. Retrieved May 10, 2017. ^ Blake, Aaron. "Coffman, Gardner join Republicans against President Trump's travel ban; here's where the rest stand". Denver Post. Retrieved January 30, 2017. ^ "To 'King Cuomo,' cutting New Yorkers' taxes is treason". New York Post. October 30, 2017. Retrieved November 11, 2017. ^ Marcos, Christina (November 7, 2017). "GOP lawmaker: Donors are pushing me to get tax reform done". The Hill. Retrieved November 10, 2017. ^ Benjamin, Elizabeth (October 26, 2009). "Erie County Executive Collins regrets comparing Sheldon Silver to Hitler, anti-Christ". Daily News. ^ Wright, David, "Trump ally: Romney a 'self-serving egomaniac'", CNN, November 28, 2016. ^ Scott, Eugene, "Congressman: Elected officials shouldn't release taxes", CNN, February 10, 2017. ^ "Congressman Chris Collins Statement on Shooting in Alexandria, Virginia". Congressman Chris Collins. June 14, 2017. Retrieved June 18, 2017. ^ Thomas, Katie (January 24, 2017). "Australian Drug Maker Has Low Profile but Powerful Backers in Washington". The New York Times. Retrieved January 24, 2017. ^ a b Wong, Scott (June 8, 2017). "Exclusive: GOP lawmaker talked stocks with colleagues". The Hill. Retrieved June 8, 2017. The Buffalo News reported that many in the [Buffalo]'s business elite had bought stock in the drug company after hearing from Collins ... Collins first invested in Innate Immunotherapeutics, which has developed a drug to fight advanced multiple sclerosis, about 15 years ago. He said he's raised money for the company during tough times and has earned a spot on its board of directors ... [In August 2016, Collins] purchased an additional 4 million shares. On [January 27, 2017,] the stock hit an all-time high of $1.83 per share, but it was trading at 74 cents per share on [May 7, 2017]. ^ a b Tau, Byron (October 12, 2017). "Congressional Ethics Office Says New York Republican May Have Violated Law". Wall Street Journal. ISSN 0099-9660. Retrieved October 13, 2017. ^ "Statement of the Chairwoman and Ranking Member of the Committee on Ethics Regarding Representative Chris Collins | House Committee on Ethics". ethics.house.gov. Retrieved April 30, 2018. ^ Erica Ordin and Maegan Vazquez. "New York Republican Rep. Chris Collins indicted on insider trading charges", CNN, August 8, 2018. ^ Mangan, Dan (2018-08-08). "Paul Ryan boots GOP Rep. Chris Collins from House panel after insider-trading charges". CNBC. Retrieved 2018-08-08.